Happy National Girl Scout Day! Shout out to all the hard working Girl Scouts out there. It's the middle of cookie season and y'all deserve a pop! At Alchemy Pops, we have a special place in our heart for Girl Scouts. Chief Alchemist, Carolyn, is a former Girl Scout! Carolyn said, "I still have my Brownie pin and my Junior vest from my Girl Scouts days! Honored to be the keynote speaker for this year's Girl Scout Gold Award Recognition Ceremony on May 5 hosted by Girl Scouts of Texas Oklahoma Plains. Didn't know I would end up starting a treat business of my own later in life, good thing I was trained well in my troop days #cookiesthenpops." The skills you learn in Girl Scouts are invaluable. They might even help you start your own business! 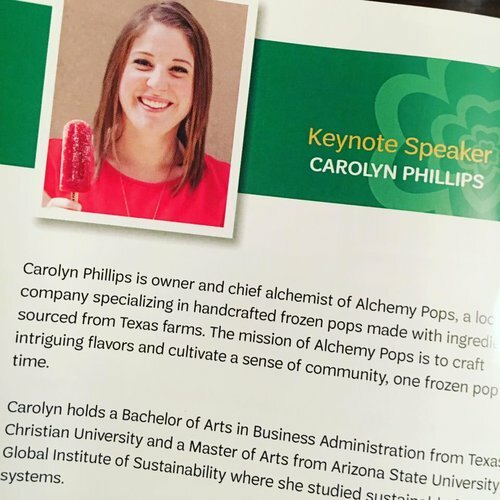 Alchemy Pops is jut one of her Girl Scouts success stories. Alchemy Pops also participated in the 2019 Girl Scouts Dessert First event, creating a delicious new pop flavor inspired by Girl Scout cookies! What happens when you combine a Vanilla pop with a Thin Mint cookie? Pure magic!✨ The best part? These Thin Mint mini pops are available in our Pop Shop while supplies last! In 2014, Carolyn Phillips and her husband created a list of 30 things they wanted to do before turning 30. One of those things was to create a side hustle which would later turn into Alchemy Pops. Carolyn threw a party for her friends and served a cool concoction, alcoholic ice pops, or Poptails! The treats were a hit and she knew she found something special. She began experimenting with different flavors made with locally sourced ingredients found at farmers markets. She would have friends come over to her home and try the pops (sign us up!) Some of the early flavors were watermelon basil, cantaloupe mint, and blackberry lemonade. Eventually, she bought her first pop cart on Craigslist and began hustling. Her first event with the pop cart was in 2015 at a charity car wash. The benefit was to help a young girl suffering with cancer. The goal was to help alleviate some of the stresses of the medical bills. Carolyn said, “[It] is an amazing feeling to set up on the site as a business, but also as someone there to help and give back”. She continued by saying, “That’s when I first realized the potential of using my business to give back to others which I later dubbed our Pops For a Cause program”. You can learn more about this program here. Carolyn has since served thousands of pops and smiles at events and at her new retail store located at 411 S Main St in the Near Southside district of Fort Worth. Stop by to check out delicious seasonal flavors before they leave! Learn more about Carolyn’s exciting pop journey featured in Chris Guillebeau’s new book coming this June, 100 Side Hustles: Unexpected Ideas for Making Extra Money Without Quitting Your Day Job. The first Alchemy Pops pop cart set up at a wedding at The 4 Eleven, where the first Alchemy Pops Shop is located! The Grapefruit Hibiscus pop is as juicy and delicious as the fruit it came from. The Honey Cream Lavender pop is a dream come true. The snowy-white pop will make any day better. The lavender is a unique and delicious touch to the most decadent pop in town. You know you need to have these at your wedding... or your next birthday party. Honestly, the time is always right for the Honey Cream Lavender pop! We love Near Southside Inc. and we are ecstatic to be attending the Near Southside Shindig on Friday, Near Southside Inc's annual fundraiser dinner. The theme is You Must Be Crazy, and maybe it's true. We cannot wait for this weekend to start! On Friday is the first of the Friday on the Green concert series and on Saturday is Open Streets! Woo!